The day is sunny with a hint of fall in the air and you’re cruising along the highway on your motorcycle, life doesn’t get much better. After a few miles that pain starts again, the aching of your throttle hand! The longer you ride the more it hurts, but you have to twist and squeeze the throttle to continue on your ride. What can you do to stop the wrist or hand pain? So what can a rider do to help relieve some of this wrist or hand pain and discomfort? Replace grips with foam or more shock absorbent grips. Try not to lean on your wrists. Stop more frequently to rest. Before you ride try to strengthen your hand and wrist by exercise. A sure fire aid would be to use a Crampbuster®, it’s a simple device that attaches to the throttle. No tools required, just spring it open and slip it on. 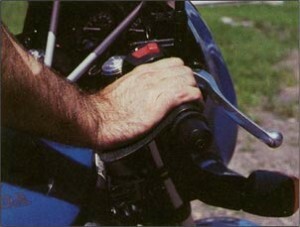 Once installed rotate clockwise freely to position the Crampbuster, but when you try to go counter clockwise it will pinch the throttle and allow you to regulate the throttle. It’s similar to an oil filter wrench. The Crampbuster paddle will help you control the throttle without having to twist and squeeze. So with a relaxed hand the pressure is off your wrist and no more pain. Believe it or not it’s that easy! The invention of the Crampbuster was originally for an older motorcycle rider who had pain while riding. Since its patented design back in the 1980’s it has helped tens of thousands of motorcycle riders stay in the saddle. We are even seeing people with mobility scooters, such as the Travelscoot® benefit from a Crampbuster. If you have a twist throttle, a Crampbuster will work for you! So get a Crampbuster today to help with that wrist pain and enjoy the ride!